Thousands of GOP delegates will fill up the Tampa Bay Times Forum again on Thursday night, this time to formally nominate Mitt Romney as the next president of the United States. 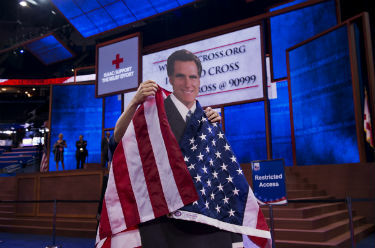 With the help of FreeCast, you’ll be able to watch Mitt Romney accept the Republican nomination live online for free. Just visit our Live Events page to find live streaming coverage of the Republican National Convention.Watch Mitt Romney accept the Republican nomination for president online live on Thursday at 10pm ET. Several other big Republican names like Chris Christie, Mike Huckabee, Newt Gingrich, John Boehner, Marco Rubio, Ann Romney and vice presidential nominee Paul Ryan have all made their speeches at the GOP Convention in Tampa and now it’s time for Governor Romney to address the country. Watch Romney give his Republican nomination acceptance speech live online for free as he tries to explain to the American people why he is fit to be the next president of the United States. Much of the criticism surrounding Romney has been focused on his economic record and his personality, or lack thereof. His wife and supporters have made attempts to reassure everyone that he does in fact have a great sense of humor and a welcoming, outgoing personality. Now, it’s Romney turn to officially address the nation as the Republican nominee for president of the United States of America. That’s why you’ll want to be sure to watch Romney accept the Republican nomination live online as he will look to show delegates and people around the country that he is more than just a Mormon business man. Much of the 2012 Republican National Convention has been focused on Barack Obama’s shortcomings and false promises since he took office. The overall theme of the 2012 GOP Convention has been centered on the phrase “We built it”, mocking the words spoken by Obama in reference to the fact that businesses don’t build themselves and that they only achieve success through the combined efforts of many. Watch the conclusion Republican National Convention live online for free Thursday night as Romney delivers his acceptance speech for the Republican nomination. Live streaming coverage of Romney’s Republican nomination acceptance speech will be available to watch online, starting at 10pm ET. Thursday is the final day of the GOP Convention and you won’t want to miss out on watching Romney’s acceptance speech for the Republican nomination live online, absolutely free. After all, he could be the next president of the United States. You can also watch Romney’s acceptance speech online live through your tablet or mobile device.